When first entering Storm Port from the north the first thing to do is head to the northeast corner to check out Valentino's Shop. He sells quite a few different items. To the west of Valentino's shop, accessible through the shop itself is a storage area with a lot of crates and barrels. It's really not worth the time to check them all. 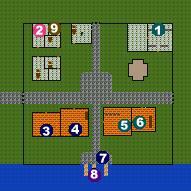 In the northwest corner of town are two buildings with two apartments each. The southern of the two doesn't contain much, but the northern ones are interesting. The easternmost of the two is where you'll learn Healing Lv.3 once you've completed Mayor Runkle's quest. The westernmost of the two contains an Elite Soldier who will attack you when you enter his apartment. He drops a Yew Crossbow among other things. In the southeast corner of town is a building with two shops. The eastern shop is a common provisioner, and the western one is a commom armorsmith. In the southwest corner of town are the administrative offices. The eastern office belongs to Mayor Runkle, who will give you a quest to rid the area of some undead who have recently started coming from the north. The western office belongs to Dana, who will sell you bundles of Fine Clothes to take up to Squiggus. She'll also tell you about a spellbook in her apartment in the northwest corner of town once you've completed Mayor Runkle's quest. The last thing to note in Storm Port is Laika, standing near the docks. She sells tickets for the boat to Gebra, which is at the end of the middle dock. The boat I mean, not Gebra.